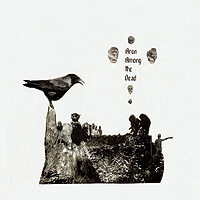 Aron - "Among the Dead"
This is the second solo record by Morten Aron (Ex-On Trial, Ghost Rocket). It was mostly recorded at home and is a collection of personal (religious in a way) journeys deep into the soul. This is not light hearted music, despite the opening acoustic number, "Early Morning". Morten is mostly inspired by the great and strange bands of the 60’s. After the beautiful acoustic "Early Morning", the music is much more like his first rare solo record (Black Beacon - only 200 pressed on Sort Hash Records). "Underneath the Flowers", "Lonely Road to Haunted Ground" (like 60’s Sci fi music or horror film stuff - very haunting and original), "Creeping Death" and "The Flow" are very haunting songs with a sound and feel like nothing I have heard before. "Morgendis/The Darkest Knight" is more than half the second side. "Kloggesang", another acoustic guitar song, closes the record. This is highly original music and mostly just electric guitar, voice and limited percussion. The record is a deep journey and like Morten writes, this was recorded at the bottom of the Soul 1999-2002). A bit scary for some people but worth the trip!